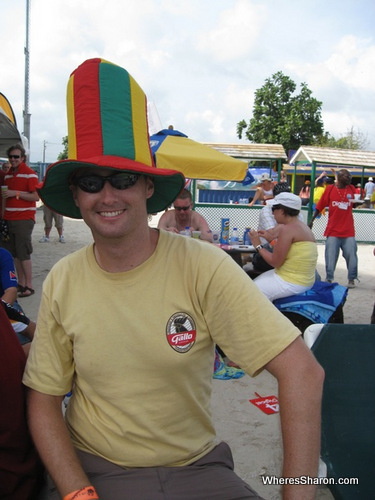 This week’s Flashback Friday post is about the amazing experience of attending a cricket test match in the West Indies!! 1 Why did I do this? You probably think I am a cricket fanatic. I’m not. In fact, I can’t stand cricket, especially test matches. They go for five days!! If that’s not boring I don’t know what is. Even worse, we only had one commercial TV station where I grew up and cricket would take over our set in the summer. No cartoons for me. Not good. However, I then read a great book, The Full Montezuma by Peter Moore. In this book, he went to the West Indies and watched a cricket test. It sounded unreal. 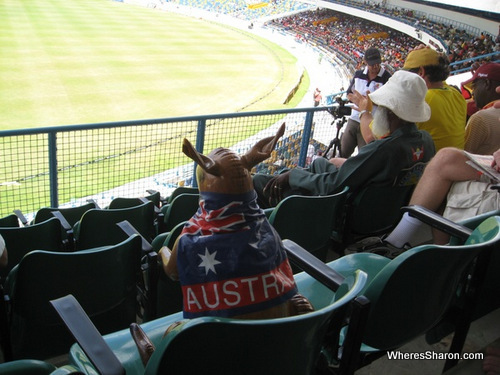 I was so hooked on the idea of going to a test match in the West Indies that I actually did go to the next Australian test match in the West Indies – five years later! When I discovered this was happening right at the time we were in the region, it took all of five seconds for me to convince J that we should go. Unlike me, he is a massive cricket fan. 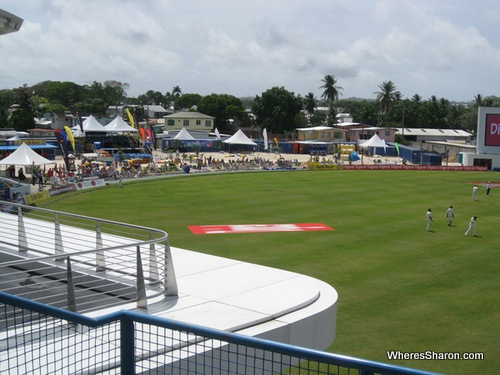 The third test in Barbados fit in with our plans so this is where we went. 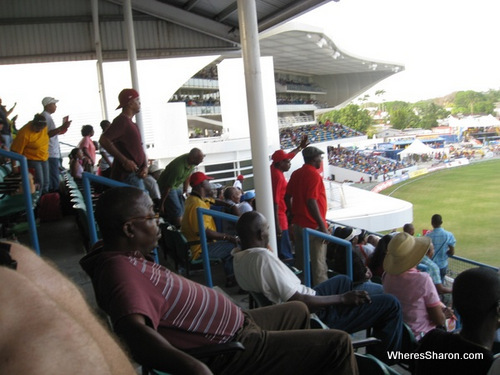 If you have ever seen the cricket on TV when it is in the West Indies then you probably know what I mean by the party stand. It is an area of the ground set up for foreigners (and some locals) to go a bit crazy and basically be stupid. To be honest, the party stand is the main reason I wanted to go to the cricket here. In many ways, it was quite awesome. It was certainly unlike any other area I have seen at a sporting ground before. It was a pretend beach area at the side of the ground. There was no actual stand as such and this is where our problems lay. There were no proper seats to sit on and no shade, apart from if you were lucky enough to get into the ground first and grab one of the few beach umbrellas. It was hot and, even with applying suncream every two minutes, I still burned. There was a big kids pool, a bar and an eating stand. Lunch and unlimited drinks were included in the ticket. There was even a beach volleyball court and some jet skis to sit on. We were so excited by the party stand concept that we spent the first day here. It was fun and we enjoyed mingling with the other Australians and West Indian supporters. We talked to many Australians, but we didn’t come across any others that lived in Australia. All of the rest of them were based in London. The game had to stop just before 4pm on that day due to rain. We were involved with a backyard cricket style game while we waited to see what would happen which was lots of fun. We enjoyed our day in the party stand. It was lots of fun and one of those things that we just had to do. We didn’t end up returning to it though, thanks to the lack of sun cover. I was sun burned too badly. Compared to the party stand, the plastic seats in the normal seating areas seemed ultra comfortable. It was so much nicer sitting on a proper seat under cover with a cool breeze, that we never returned to the party stand. It was nice to be surrounded by West Indians. If we wanted alcohol, that was still available. 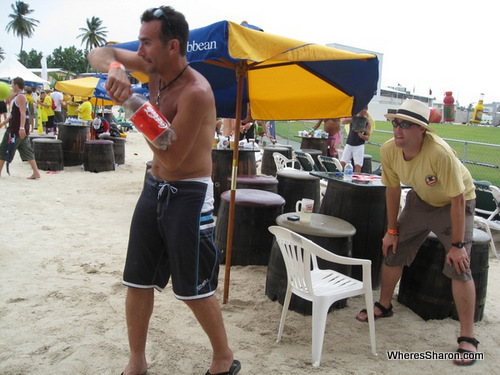 We could actually buy whole bottles of rum at the ground! The supporters were amusing most of the time. On the last day especially, there was a great atmosphere when it looked like the West Indies were in with a shot. However, they did ruin our win a bit with all the carry on and screaming, so we couldn’t hear the speeches. This was a much better place to sit though if you actually want to see the game or not be burned. 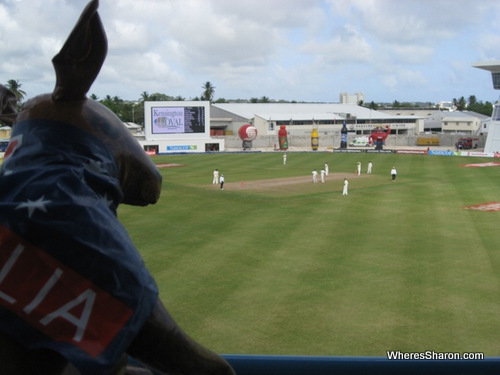 Many Australians sign up for expensive cricket tours to see Australians play overseas. This was outside our budget and really not necessary. Arranging accommodation was easy. I found a place online and emailed them and it was arranged. 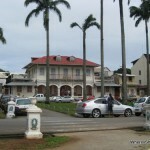 We paid only US$50 a night for a studio apartment by the beach in Worthing. The tickets were more complicated. We emailed, rung and did not get very far. We ended up being able to book party stand tickets for the first day via email. We picked them up on arrival in Barbados. We also bought tickets for the second day in the stands at this time. We never saw the ground full though, so we could have just bought tickets as we went (which is what we did on the other days). This cost was US$75 for a day in the party stand (including lunch and unlimited drinks). We paid US$30 for normal tickets in a good stand and only US$5 on the last day. Honestly, we had a great time. The party stand was a bit disappointing because of the shade issue. We did enjoy sitting in the regular stand though so we got over this quickly. I’m still a bit shocked that I actually went to all five days of a test match, but it was not a hardship at all. I enjoyed it, apart from one of the sessions on the third day when seemingly nothing happened. I came out of it with a new appreciation for test cricket, although I am never going to be much of a fan. J, being a cricket fan, absolutely loved the experience. Even if you have no idea what cricket is, if you are in the West Indies when a cricket match is going on, it is well worth the experience of going along, at least for a day. 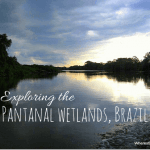 After the cricket finished, we were off to start our South American journey in the Guianas. 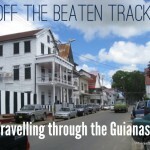 Read about it in our next Flashback Friday post, off the beaten track – travelling through the Guianas. 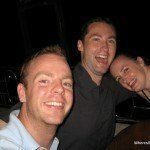 You can also read another Flashback Friday post from earlier in this trip when I spent a random birthday in Laos. 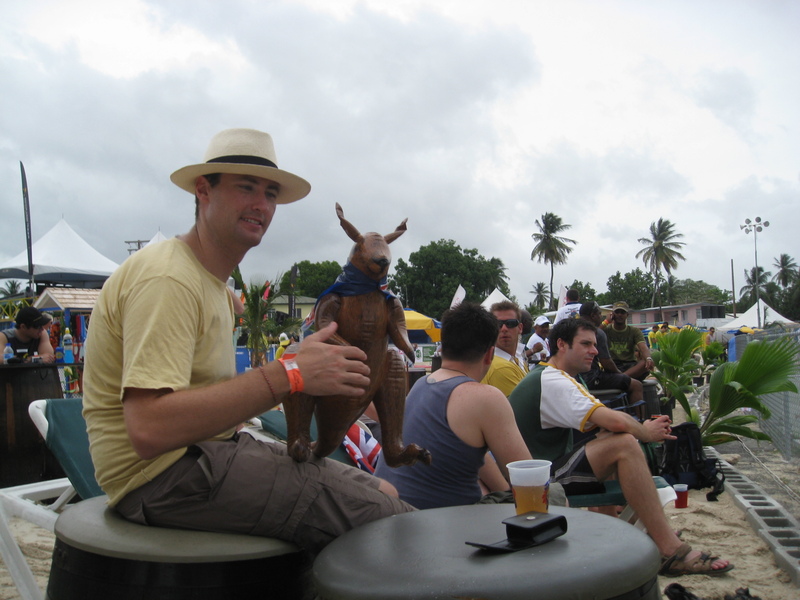 Would you like to go to the cricket in the West Indies? Do you travel to watch sporting matches? 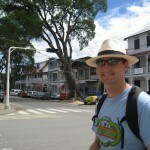 Should I visit Cabarete or Las Terrenas in the Dominican Republic? Unfortunately, I have no choice but to know the basics. To be fair, I do like a bit of backyard cricket, I just hate watching it. Sport is always more fun overseas though!! Personally, I have no idea how to play cricket but it sounds like a great time and I would anything once for the experience. There seems to be a party atmosphere surrounding the game which is awesome! I love watching hockey (hey, what Canadian doesn’t?) and I can’t wait to bring my husband to an NHL game. I got him into watching hockey during the Olympics and now we watch games regularly on TV!! I would love to go to an ice hockey game in Canada. Lol unfortunately the beer wasn’t very good and the spirits were made so strong that I found it hard to stomach them!!! It was definitely an experience though. If only I had darker skin, I probably would have gone back for another day in the party stand. I would love to see cricket game once, first to learn the rules:) Most people say it’s soooo boring (as I read you don’t like it too much either), but I tend to like boring things (I like watching snooker for example). And in the West Indies it must be fun (sometimes they show images from cricket games from there in CNN) and there’s always seem to be a great atmosphere! Who did you contact for tickets in the party stand? A group of us are going out for the England test in a few weeks and are struggling to get tickets outside of the tour operators. Hi! I really can’t remember who it was exactly but I know we had to ring the Barbados cricket association or something like that and then got the number of the operator direct. However, we could have easily turned up and just got them. We only bought ahead for the first day and it would have been no problem to go every day.